For some reason, the best travel videos seem to come out of Southeast Asia. The great "Oh Angkor", shot on the GH2, is one example. Another is "Thailand Singapore Bali" shot primarily with the Sony RX100. This is great video quality to bring back from vacation - especially considering that a camera the size of a cellphone and two tiny lenses were used to shoot it. Some are saying that this is primarily a "professional" camera, but I beg to differ. In the hands of advanced amateurs who know what they are doing, the Pocket is going to be a terrific little camera to travel with. Just make sure to bring along a few extra Nikon EN-EL20 batteries, an MH-27 charger and a laptop to manage your cards! 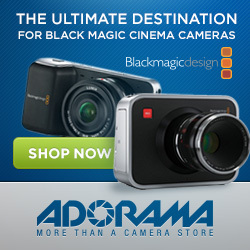 Again, you can pre-order your Pocket Cinema Camera here or by clicking on the Adorama display ad below. If you don't want to wait for the Pocket, you can order a Cinema Camera EF or MFT from Amazon. It won't cost you anything extra, and it will help to keep posts like this coming.